I've decided that Bibingka would be a good name for my next cat. I'm not planning to get another cat for some time, as I already have 2 and 3 year olds, but it seems like a good pet name. 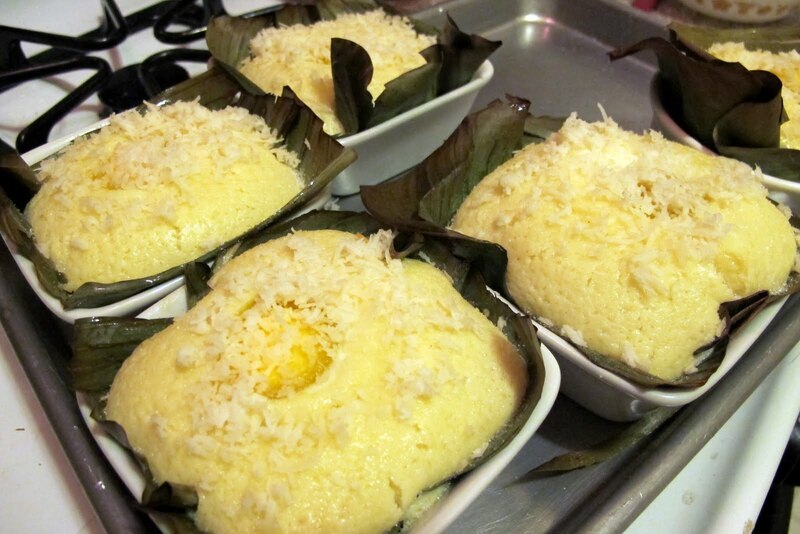 In actuality, bibingka is a Filipino cake, most often rice based. It's slightly sweet and features, get this, a slice of salted egg on the top. That seems pretty odd for a dessert, but then again, Asian foods are often like that - using contrasting flavors in the same recipe. Filipinos love salty sour. Here in the States we've seen this done more often lately with things like kettle corn, salted caramels, etc. 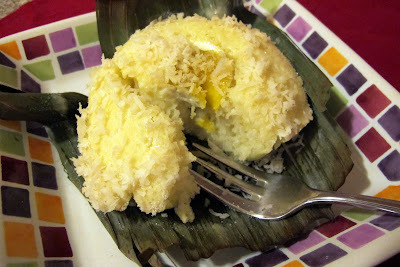 The bibingka recipe comes from my Filipino blogging friend, Jun at Jun-blog. Jun says that this particular type is traditionally eaten at Christmas time. I had a few Christmases in the Philippines when I was a child, but I guess my family was too Western - I don't recall these cakes at all. I must learn bits of my Filipino culture late in life, on my own, with assistance from my adopted Filipino 'family'. But for Jun, these are an important part of his memories and associations with Christmas time on the islands. This bibingka recipe was the reason I had made the salted eggs a few weeks ago. I knew I needed some for this recipe and it was a good blog post all on its own anyway. This recipe is very simple. Mix, pour into the banana leaf lined ramekins,and bake. The taste is simple too. I had been apprehensive about the salted egg, but soon found that it worked perfectly. Lightly sweet, slightly moist cake mixed with tiny bits of saltiness from the egg. Don't be afraid to put it in. You'll be happy with the results. This recipe is completely gluten-free as glutinous rice does not equate to gluten. Line six tart pans or ramekins with banana leaves and brush the leaves with butter. Combine rice flour, glutinous rice flour, baking powder, and sugar together in a bowl. Beat eggs in a bowl of a stand mixer fitted with a paddle. Add butter and coconut milk and mix well. Add the flour mixture and blend well until smooth. Pour the rice batter equally into the six pans or ramekins. Lay a slice of salted egg on top and bake until the cake is cooked through, 20 to 25 minutes. Take the cakes out of the oven and brush the top with butter. Turn the broiler to low and broil the cakes to brown the top for about two minutes. Serve the cakes warm. Brush the cakes with butter and sprinkle with sugar, grated coconut, and grated Edam cheese. 1. For the rice and glutinous rice flour, I recommend using the Thai brand commonly found in most Asian grocery stores. 2. 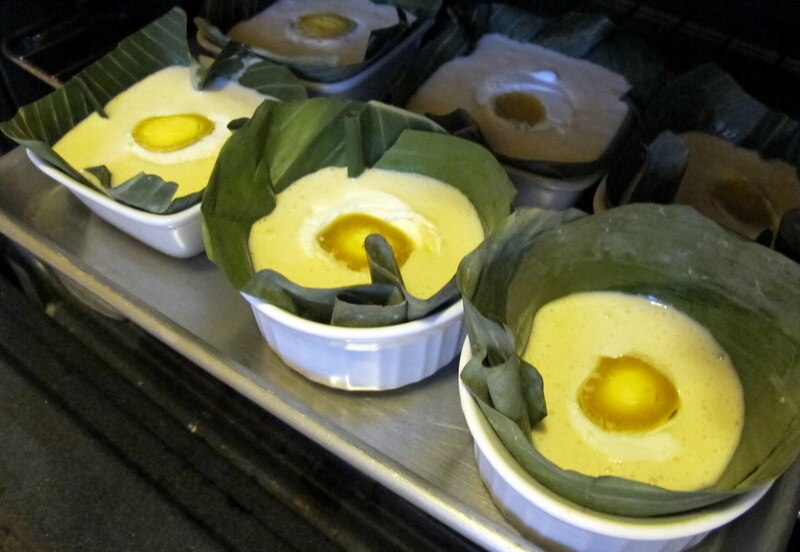 Use either tart pans or ramekins lined with banana leaves cut into circles. The cakes baked in 6-inch pans more closely resemble the traditional ones. The cakes baked in 4-inch ramekins are thicker and take longer to bake. 3. Instead of a sliced salted egg, the cakes can be topped with slices of Edam or Gouda cheese. 4. When using frozen grated coconut let the grated coconut thaw then place the thawed coconut on paper towels to soak up the extra moisture. Place them on a baking tray and lightly toast them for about a few minutes with the broiler turned on low. Use grated coconut and NOT grated young coconut.